I got Gus in the first place in part because I wanted to learn about the Small Dog Experience. Small dogs are now the most popular dogs in America, according to recent surveys. I write about dogs and had never had one. Gus offered me a wonderful opportunity to get to understand the small dog experience (all the big men in trucks up here ride around with small dogs, many of them cry just from talking about them), but that story was somewhat overshadowed by his illness and ultimately, death, from megaesophagus, a disease of the esophagus that prevents dogs from digesting their food. I’ve been assured by a half-dozen people online that Hannah’s puppies, if she has them, will be able to come to our farm either in August, September, October or November. They all swear they know and everyone else is wrong. I’ll go with the vet, looks like October, possibly late September. Any month is good, the sooner the better, I can’t begin to imagine why there are so many different ideas about gestation and delivery, although it is pretty typical of social media. There are lots of expert out there. I don’t really care who is right, although I’d love to have the puppy here for our October Open House on Columbus Day Weekend. I am often asked about the Small Dog Experience from my perspective and I have been thinking about it. Small dogs are different from big dogs, even though we try to treat them in the same way with the same training ideas. I believe a small dog should be treated like a dog, not a crystal glass. Before Gus got so sick, i was paying careful attention to the difference. Small dogs are very smart, as smart as my border collies for sure. They figure out the politics of the house quickly, are easily trained up to a point. Gus was affectionate and playful in almost equal degrees. He was always game to play with Fate’s toys, steal them and hide them. Small dogs are often fearless, nature has endowed them with megalomania, they believe they are huge, and they believe they are in charge of everything they see. They believe everything in the world is theirs, and owes them worship and accommodation. Since they have no idea that they are small – they see themselves as medium-sized Tyrannosauruses – they defer to no human or animal. They believe every sofa was placed in the home for their convenience, every treat is theirs, every toy was purchased for them, every lap is waiting for their attention and comfort. Small dogs, unlike border collies, have a refined sense of humor. Because of their small bodies and large personalities, they often appear ridiculous, I found myself laughing at Gus 20 times a day, and laughing feels good, especially in our constipated nation. Small dogs offer some convenience to Americans, who most live now in small, confined and congested apartments and homes in urban and suburban areas. Small dogs take up less space, they eat less, poop less (and small), seem to pose little threat to building owners and landlords, need less exercise, shed less and love small spaces to sleep in or on. They attach to people easily and readily and are fond of cuddling and curling up next to people, which makes many people ecstatic. Gus stuck close to home, he never seemed to even think of running off. Once he ran down the road we are walking on to bark furiously at a huge Lab, a dog he had never seen. He ran right up to the dog, who towered over him and barked loudly, and i thought Gus was going to faint. He screamed as if he was being murdered, turned back, looked at us and ran for his life. He never did that again. We decided to treat Gus like any of our dogs, he was surprisingly hardly. He was not afraid of the sheep, be befriended the donkeys (you have to be careful with donkeys and new dogs. but we have done this before). But of course, he is not like the other dogs in many ways. Gus had a monumental ego, he thought he could do everything the border collies did, and he sometimes did. He could halt the sheep with his barking (but not turn them around or move them), and he often kept up with Fate or Red as they ran, even on his small legs. The sheep were stunned by him, they seemed to have no idea what he was, and when they stomped their feet at him, he just stared at them and chuckled, he seemed to find them ridiculous. Gus handled the cold well, he only needed a sweater once or twice, and if he got cold, he was no stoic, he went right to the door and demanded to be let in. Small dogs love to ride in cars, and because of their size it is easy. Sometimes they sit up front between the driver and rider, sometimes they end up in somebody’s lap and doze off. Sometimes they love to look at the window. I didn’t get to train Gus too intensely before he got sick, when training stopped. In a minute or two, I got him to come and/or sit using treats. He got it right away. We are trying to figure out how we will handle the new Boston Terrier Puppy (we both wanted another.) Will he or she be a farm dog? A run-in-the-woods dog, like Gus was. And how do I get a Boston Terrier puppy to lie down on command? Beyond that, small dogs, perhaps because of their seeming vulnerability and larger than life personalities, seem to touch their humans in a very personal and individual way. I am no big man in a truck, but I was beginning to understand why these big tough men just melt around their little dogs. Men are rarely able to show much emotion, but around their Pugs and Corgi’s and Bull Terriers, they just turn to mush. Maybe we need to send a few of these dogs to Washington, i think they are testosterone killers. Stay tuned. 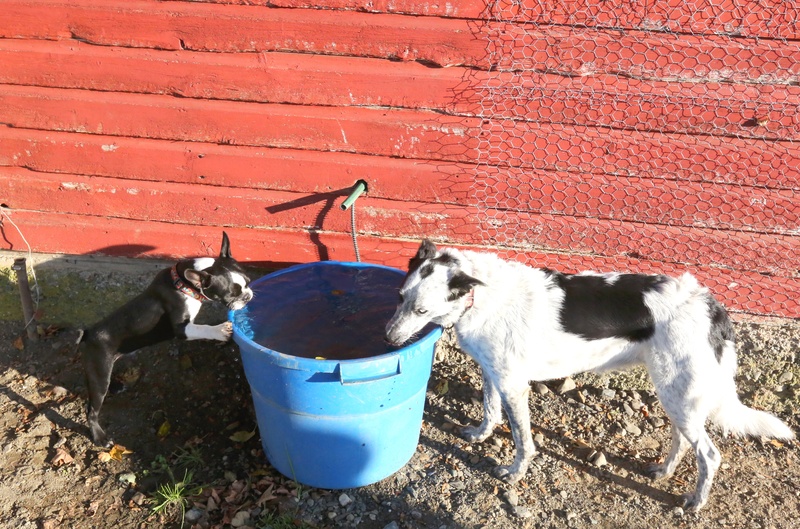 We got to chapter one of the Small Dog Experience, we are eager to go further. Yup, every word is true. Gus taught you the lessons that my little Bonnie is teaching me. I have two 70+ pit bulls and one 12 pound Papillon who is the undisputed leader of the pack. She growls, they freeze in their tracks. I’ve been fostering pit bull puppies for a couple of years, and every one of the 25 puppies who have cycled through have deferred to my one small dog, making my job much easier. She teaches them to behave, and somehow they figure out that she gets to be on the furniture and they don’t. I don’t have a big truck, but she gets to go on car trips alone with me, something she obviously looks forward to…just as I’m looking forward to your new puppy stories.